Entertainment Earth has gone live with their Force Friday launch of the Star Wars Shop! Click on through to check out dozens of link to products from Hasbro, LEGO, Funko, Bioworld, Comic Images, DK Publishing, Loungefly and More!!! 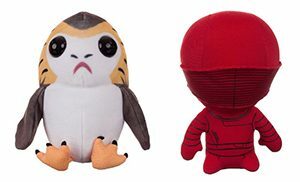 Toys”R”Us also has new 6.5″ plush figures from Comic Images for The Last Jedi including the Porg and Praetorian Guard. Click the image above to see the selection. Episode 417: Toy Fair 2014 – LEGO and more from Javits! In this special episode, Arnie and Marjorie look at all the new Star Wars toys coming from LEGO, Kotobukiya, Uncle Milton, and more! Star Wars fans have a reason to be excited after last week’s New York Toy Fair International. Watch this week’s podcast to see all the new toys and collectibles! From LEGO to Uncle Milton, Kotobukiya, Underground Toys, and so many more, they’re all in this week’s continuing Toy Fair coverage! Today we officially close out our coverage on Toy Fair 2012 and we’ve loaded our galleries with even more images! Head on in to check out products from Hasbro, LEGO, Kotobukiya, Diamond Select, Uncle Milton, Mimobot, Jazwares, Comic Images, Underground Toys, Funko and more!! !